I am going to start a new serial post where, once a week or so, I show you something that is on my shelf. Simple. To start this off I will pick something that has been on my shelf for a long time. 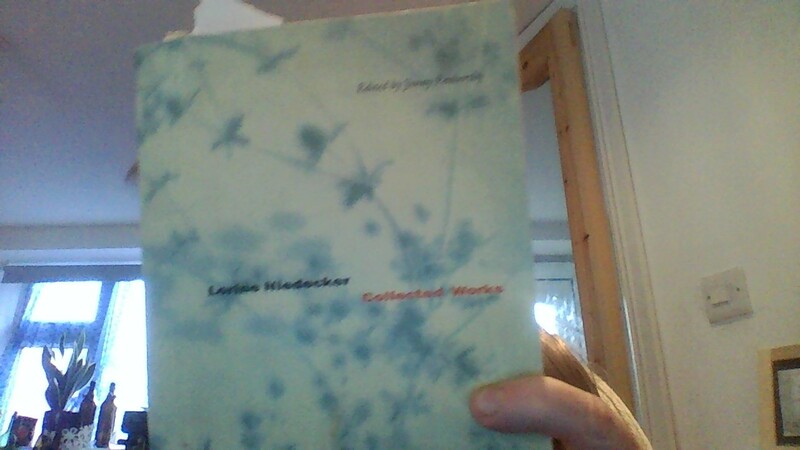 Lorine Niedecker’s ‘Collected Works’ edited by Jenny Penberthy and published by University of California Press. The hardback was published in 2002 and the paperback (which I have) was published in 2004. Niedecker (1903-1970) is an integral part of an American modernist tradition. She was the only (where there others?) woman associated with the Objectivist and was for many year neglected (still is in someways). During the 1960 her work started to be published more widely thanks to British’s presses such as Fulcrum. But this kind of info can be found online easy enough. breakable from the shelves of Marianne Moore. I’d poise myself,a cuckoo, flamingo-pink. Cummings irony, a little drunk dead sober. Man, that walk down the beach! and sing a quiet thing: sincere, sincere. And that would be Reznikoff. There is a simplicity in her work but one that is clearly crafted and hard to master. There is a real tension in some of the lines which point to her being an influence on the Likes of Frank O’Hara and Robert Creeley. another poem.